The Predator Series was made for hunters who demand all-around capability in their optics - mobility without weight, ease of use and bright picture in any light. With its lightweight roof prism design, game-revealing CAT™ (color adjusted transmission) coatings and excellent low-light performance, this is the perfect choice for turkey hunters, bowhunters, black powder enthusiasts and anyone who hunts the early season or in heavy cover. amplifies contrast in the peak human vision sensitivity range, to spot game in any environment. with latest generation advances in low light performance and brighter images and up to 3-4% better light transmission. Predator 10x26 is rated 4.7 out of 5 by 28. Rated 5 out of 5 by Dolphin from Excellent quality for a pocket size binoculars Excellent quality for a pocket size binoculars, easy to focus with crispy clear vision, comes with a carrying case, strap and one top cover protection lens (honestly this cover top lens has a bad design). My complaint has NOT cover protection for the bottom lenses, I don't why is not included. Besides that, perfect binoculars for all activities. Waterproof and anti shock resistance and decent weight. Rated 5 out of 5 by Blackweb from Small but effective I actually purchased the Predator Xtreme 10x26 that was on sale, but I guess they are discontinued. I have not had time to use extensively yet. I took the bino's out back and was really amazed by the quality of the glass. I was not sure how well the view would be with 26mm objective lenses, but they worked very well. A lot brighter than I expected. The frame is small and light, which will be great for hunting and backpacking. I am highly impressed with the provided carry case. The only thing I would have liked to see change is the eyepiece design. I like the type that turns in or out for different uses, I feel the eyepiece can be too close. Great product from Steiner, I highly recommend this product. Rated 5 out of 5 by BillC from great optics excellent customer service I purchased my binoculars last year and they developed an alignment problem. I returned them and within 3 weeks I received a new pair, no questions asked. They are clear and sharp as well as lightweight. Perfect for hunting and bird watching. Great customer service. Rated 4 out of 5 by Bilbo BagEndHollow from The Predator 8x came highly recommended I thought the 10x would be better but I would prefer the extra field of vision of the 8x. rather than the 2x power, now that I have the 10x. Otherwise they are excellent. Took them first time birding with an avid birder he was impressed with the ease of focusing. Rated 5 out of 5 by Buck from The best binos I bought these 3 years ago. They are the best binos I have ever looked through. Nice and light carry them into the stand day in and day out. They are also nice for scouting. Will buy again in a heartbeat. Rated 5 out of 5 by Saturn89 from Nice, compact, clear. Very easy & light to carry. Focus well. My son & I each bought Predator 10x26 an are happy with them. Rated 5 out of 5 by coloradohiker from My second pair of Steiner Binoculars I chose Steiner because I have owned a pair of Steiner 7x50 Marine binoculars since the early 1970's and have always been pleased with them. I decided I wanted to purchase a more compact binocular and never seriously considered another brand. I wanted both quality and still remain within a reasonable price range. Steiner had what I was looking for. you say coating but is it single layer or multi layer coating? 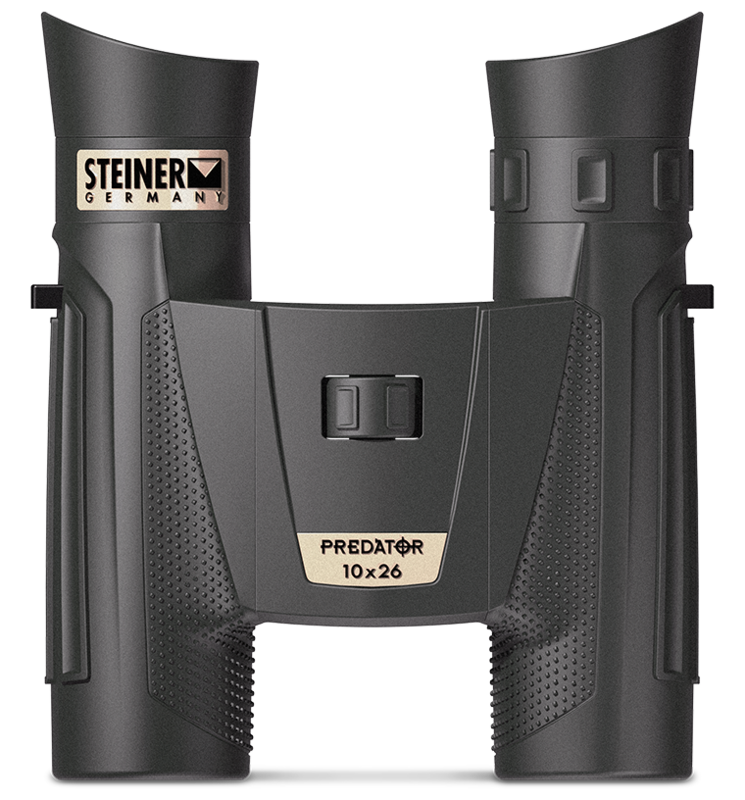 All glass-to-air surfaces outside and inside Steiner binoculars are fully multi-coated. I bough a Predator Pro 10x26 binocular P/N: 5878 0909. &nbsp;They came with a neoprene cover for the eye cups, but not caps for the bottom of the lenses. &nbsp;I saw a review where the author had eye cups over the bottom also. &nbsp;Were these missing from mine? The compact model Predators are not supplied with objective covers, nor are there parts available. The larger 42mm-objective models feature the N2 Fog-stop valves, indicating they've been purged with Nitrogen. The ultra-compact binoculars such as 8x22 and 10x26 do not have this feature. Is the Predator 10-26 fog proof? All of our optics are fog proof. Hi I have crystal clear pair if 10x26 predator pros( from 2008 per your serial # breakdown). Are they submersible&nbsp;or water resistant? thx! Those binoculars are water resistant (safe from rain, sea spray, etc) but are not submersible. Are these bino's center wheel focus only, or do they have separate eye piece adjustment ? The left eyepiece has an independent diopter adjustment, but once set for your eyes, the center focus wheel is indented to be the only adjustment used.